One small room that is often overlooked when organizing a home is the laundry room. Like the kitchen, this is another hub for your entire family. Dirty and clean clothing are coming in and out everyday and having an organized method and place to put these items can save you both time and stress in your life. Usually, organizing a laundry room doesn’t take very long, but it can make a major positive change in your family’s life. 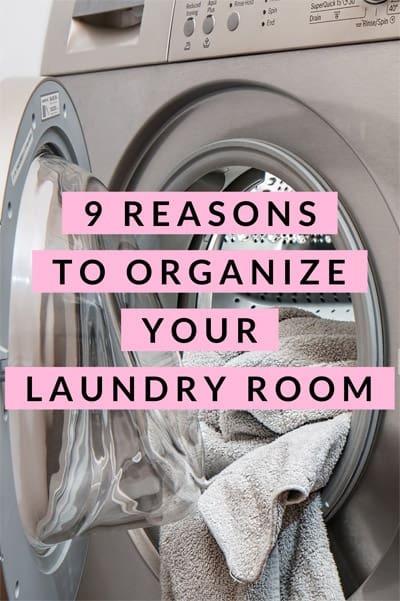 Here are 9 reasons to organize your laundry room. By creating routines for chores such as laundry for yourself and your family, you will be sure that laundry is always getting taken care of in your home. Once a daily or weekly laundry routine is established, it is easier to keep it up to prevent an overwhelming backlog of piles of dirty laundry. Lost time is one thing you can never get back, by having an organized laundry room and systems to get laundry done, you will save time that can be spent doing more enjoyable things. If you’re able to keep your clothing clean and able to find it when needed, you will be less likely to re-purchase an item your already own. By taking care of your clothes, they will last longer, saving you money in the long run. If you have a system in place for getting clothing mended and dry cleaned, and a routine for washing, drying and putting away clothes, you will be able to dress better because all of your clothes will be clean, ready to wear and easier to find. By organizing your laundry room, you may free up extra space that can be used to store other items. For example, some laundry rooms have cabinets above the washer and dryer that can be used to hold a variety of other household items. If you want to air dry delicates or certain types of clothing, by organizing your laundry room you can create a place to hang this clothing until it is ready to be put away. Designating one place for this will prevent other rooms from becoming cluttered. By setting up a system to separate different colors of fabrics, you will prevent colors from running in the wash.
By organizing your laundry room and setting up a system, you are demonstrating organizing methods to your children. If they are old enough, you can teach them sorting, organizing and cleaning skills in addition to how to care for their belongings. By regularly washing, drying, mending, ironing, folding and hanging clothing, you’re taking better care of it all, which will make it last longer. You spent hard earned money on these clothes, so it is best to take care of these items so you can wear them for a long time. Nancy Haworth is a Professional Organizer and Owner of On Task Organizing, LLC in Raleigh, North Carolina. She assists residential clients throughout the area in organizing homes, decluttering, moving, and managing time. She has been a member of the National Association of Productivity & Organizing Professionals since 2011. Having a routine, the right tools, and adequate space (somewhere, if not the actual laundry room) to gather, fold, hang, etc. your laundry makes the chore so much more pleasant! Just stopping to think for a minute and pinpoint why you find a chore unpleasant can lead to a solution. That’s a very good point! Thanks for commenting.